At 500 PM AST (2100 UTC), the center of Tropical Storm Maria was located near latitude 37.8 North, longitude 57.4 West. Maria is moving toward the east-northeast near 31 mph (50 km/h), and this heading with an increase in forward speed is forecast during the next day or two. Maximum sustained winds are near 60 mph (95 km/h) with higher gusts. Maria is forecast to become extratropical between 24 and 36 hours. Tropical-storm-force winds extend outward up to 255 miles (405 km) from the center. The estimated minimum central pressure is 988 mb (29.18 inches). On Thursday, September 28, 2017, President Trump authorized a waiver to the Jones Act which will loosen shipping rules regarding Puerto Rico. The waiver took place immediately and will be in effect for 10 days. It will apply to all cover all products being shipped to Puerto Rico. The waiver will guarantee the needed equipment to repair infrastructure damaged by the storm and restore emergency services. Following the 10-day period, the waiver could be extended if necessary. At the request of Puerto Rico Governor Ricardo Rosselló, Governor Rick Scott traveled to San Juan, Puerto Rico tomorrow to help coordinate response and recovery efforts following Hurricane Maria. The Governor wasjoined by Florida National Guard Adjutant General Major General Michael Calhoun, Florida Department of Law Enforcement Commissioner Rick Swearingen and Florida emergency management officials. Following his trip to Puerto Rico, the Governor went to Washington, DC to meet with President Trump. Payments can be made only for the amount on an invoice that has generated. Credit card, debit card and electronic check conversion payments are not accepted. The payment will post to PolicyCenter® within 30 minutes in most cases. Due to system issues, there will be rare cases when it will post by the next calendar day. A confirmation email will be sent within 15 minutes after the payment is submitted. Agents must continue to make payment plan changes in PolicyCenter. 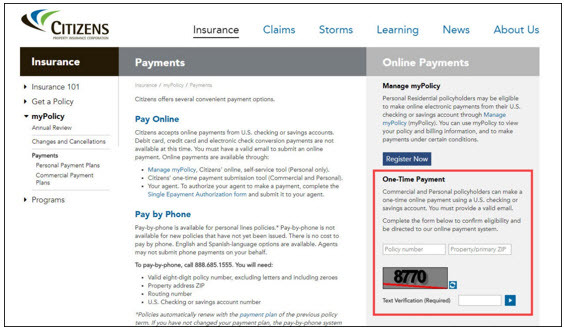 Policyholders making payments on multiple policies must do so in separate online transactions; they should not use the back button. Payments submitted by agents or agency staff on behalf of a policyholder must continue to be entered in PolicyCenter or by mail. Policy is inactive or cancelled. Billing invoice has not processed and is not yet available. Appointed agents can submit questions to Citizens by logging in to the Agents website and choosing the Contact Us link on the top of the website. Citizens should respond within three business days. Daily from 9 a.m. to 5 p.m. until Sunday, September 24. Note: See our Hurricane Irmawebpage for information after September 24. Daily from 7 a.m. to 7 p.m.
Walmart parking lot, 1425 NE 163rd St.
On September 13, 2017, the Office of Insurance Regulation (OIR) issued an Emergency Order as a result of Hurricane Irma. A number of inquiries about how to apply the provisions outlined in the Emergency Order have been directed to OIR. OIR does not render interpretations of statutes, except in rules for interpretations of general applicability or in declaratory statements for interpretation of a more limited applicability, assuming the requirements for such a statement are met. Please refer to Section 120.54, F.S., for the applicable statute on rules. Further, declaratory statements are covered by Section 120.565, F.S., and Florida Administrative Code (F.A.C.) Chapter 28-105. While the Office is unable to provide individual responses to the specific questions or scenarios, the following FAQs are broad guidance in response to those most frequently submitted. Q1. Does the Emergency Order apply to all lines of insurance? A. The Emergency Order applies to all lines of insurance. Q2. Does the Emergency Order apply to Excess and Surplus Lines insurers? A. The Emergency Order applies to Excess and Surplus Lines insurers. Excess and Surplus Lines carriers are not subject to the provisions on rate filings but are subject to the restrictions related to the extension of grace periods and temporary postponement of cancellations and nonrenewals as outlined in the Emergency Order. Q3. Does the Emergency Order apply to Life insurance, Health insurance, and Annuity Contracts? A. The Emergency Order applies to Life insurance, Health insurance, and Annuity Contracts. Q4. Are there any kinds or types of insurance to which the Emergency Order does not apply? A. The Emergency Order is not applicable to policies for the kinds of insurance listed in Rule 69O-142.015(2)(p), F.A.C. that cover a business that is domiciled or maintains its primary place of business outside of the State of Florida. Q5. Does the provision of the Emergency Order prohibiting insurance companies from canceling or nonrenewing policies apply only to consumers with personal lines or commercial residential insurance policies that suffered damage due to Hurricane Irma? A. The language provided in Rule 690-142.015(2)(e), F.A.C., which prohibits the cancellation or nonrenewal of a policy or the issuance of a notice of cancellation or nonrenewal between September 4, 2017 and October 15, 2017, applies to all policies or contracts of insurance and not just to insureds that experienced damage as a result of Hurricane Irma. However, the provisions of cancellation and nonrenewals in Section 627.4133(2)(d), F.S., only applies to residential property. Q6. Does the provision of the Emergency Order prohibiting insurance companies from canceling or nonrenewing policies apply if proper notice was sent prior to August 25, 2017? A. The Order prohibits both the cancellation or nonrenewal of coverage between September 4, 2017 and October 15, 2017 or the issuance of such a notice during this period of time. Notices sent prior to August 25, 2017, are included in the Emergency Order if the effective date of the cancellation or nonrenewal was to take effect between September 4, 2017 and October 15, 2017. Q7. If an insured files a claim for damage from Hurricane Irma, when can an insurer cancel or nonrenew coverage? A. Section 627.4133(2)(d)1., F.S. states an insurer may not cancel or nonrenew a personal residential or commercial residential property insurance covering a dwelling or residential property located in this state which has been damaged as a result of a hurricane or wind loss that is the subject of the declaration of emergency for a period of 90 days after the dwelling or residential property has been repaired. A structure is deemed to be repaired when substantially completed and restored to the extent that it is insurable by another authorized insurer that is writing policies in this state. Q8. May insurers cancel or nonrenew a policy due to the exceptions provided in Section 627.4133(2)(d)2., F.S.? A. An insurer or agent may cancel or nonrenew a residential policy after October 15, 2017 due to the exceptions provided in Section 627.4133(2)(d)2., F.S. Q9. Does the Emergency Order prohibit lawful policy rescissions? A. A lawful policy rescission is not affected by the provisions of the Emergency Order. Q10. Are insurers required to send a notice to an insured informing them their coverage is extended? A. If an insured was sent a notice of cancellation or nonrenewal which would be effective between September 4 and October 15, 2017, insurers should provide some type of communication confirming that the date of cancellation or nonrenewal has been deferred or extended at least until October 15, 2017. This does not apply to new policies issued on or after September 4, 2017. Q11. Are insurers allowed to charge additional premium for extending coverage as required by the Emergency Order? A. Rule 69O-142.015(2)(h), F.A.C. permits insurers to charge pro-rata premium for extending coverage. Rule 69O-142.015(2)(i), F.A.C. permits an insurer or other regulated entity that was unable to cancel or nonrenew a policy due to the operation of this rule, upon proper notice, to cancel or nonrenew such policy effective on the date the policy would have otherwise been cancelled or nonrenewed in the event the insured has not filed a claim under the policy and not paid outstanding premium due. Q12. Are insurers allowed to cancel coverage at the request of the insured? A. Insurers are allowed to cancel coverage at the written request or concurrence of the insured. Insurers may also allow insureds to cancel coverage by telephone or other electronic means as long as the insured’s request or concurrence is recorded and maintained by the insurer. Q13. How is an insurer’s offer of replacement coverage affected by the Emergency Order? A. Rule 69O-142.015(k), F.A.C. states an insurer’s offer of replacement coverage, which is voluntarily accepted by an insured or applicant in an affiliated company, or made pursuant to a depopulation program, assumption or other arrangement approved by the Office does not constitute a nonrenewal or cancellation for the purposes of the Rule or the Emergency Order. Q14. October 15, 2017 and December 3, 2017 both fall on Sundays. Does that mean that the final dates for both periods actually end on the following Mondays, October 16, 2017, and December 4, 2017? A. In accordance with Rule 69O-170.113, F.A.C., the last day of the period shall be included unless it is a Saturday, Sunday, or legal holiday in which event the period shall run until the end of the next day which is neither a Saturday, Sunday or legal holiday. Q15. What other time periods are extended by the Emergency Order? A. Any policy provision, notice, correspondence, or law which imposes a time limit upon an insured to perform any act or transmit information […] with respect to a contract of insurance, which act was to have been performed on or after September 4, 2017, the time limit shall be extended until December 3, 2017. Q16. Can insurers back date to remove policy credits or discounts if an insured fails to provide necessary documentation? A. If the insured fails to act or provide the necessary information or documentation by December 3, 2017, discounts or premium credits may be removed retroactively. Q17. Does the Emergency Order also extend time periods for insurers? A. The extension of time until December 3, 2017 with respect to time limits imposed upon insureds by any policy provision, notice, correspondence, or law to perform any act or transmit information with respect to a contract of insurance applies only to insureds. Q18. Are insureds required to make premium payments when due? A. Insureds are required to make premium payments when due but insurers shall not effectuate cancellation of any policy between September 4, 2017 and October 15, 2017. In accordance with Rule 69O-142.015(2)(i), F..A.C. an insurer or other regulated entity that was unable to cancel or nonrenew a policy due to the operation of this Rule, may upon proper notice, cancel or nonrenew such policy, effective on the date the policy would have otherwise been cancelled or nonrenewed, in the event the insured has not filed a claim under the policy and not paid outstanding premium due. Q19. How does the Emergency Order affect the provisions of Premium Finance contracts? A. The language provided in Rule 690-142.015(2)(d) and (e), F.A.C., which prohibits the cancellation or nonrenewal of a policy or the issuance of a notice of cancellation or nonrenewal between September 4, 2017 and October 15, 2017, applies to all policies or contracts of insurance, except at the documented request or written concurrence of the policyholder. Subsection (2)(o)3. of the same Rule states that upon receipt of a request for cancellation from a premium finance company after the grace period specified in an Emergency Order expires, the insurer will process the cancellation in accordance with paragraph (i). Paragraph (i) of the Rule permits an insurer or other regulated entity that was unable to cancel or nonrenew a policy due to the operation of the Rule, upon proper notice, to cancel or nonrenew such policy, effective on the date the policy would have otherwise been cancelled or nonrenewed, in the event the insured has not filed a claim under the policy and not paid outstanding premium due. In addition, premium finance companies must apply the provisions outlined on pages 6 and 7 of the Emergency Order and may not apply late charges, as the result of the required extensions. Q20. If an insurer is financing the premium for its insured, is the insurer subject to these provisions? A. Only premium finance companies are subject to the provisions referenced in Rule 69O-142- 015(2)(o), F.A.C. Q21. Rule 69O-142.015(2)(o)4., F.A.C. allows any insurer who is unable to cancel because it has received a claim under a policy for which it receives a notice of cancellation from a premium finance company to offset the balance owed the premium finance company, as disclosed in the notice of cancellation, from the first claim payments made under the policy. May insurers similarly offset balances owed premium finance companies if the first claim payment was made before the insurer received a notice of cancellation from the premium finance company? A. While the Rule does not specifically address this issue, the logical application of the Rule appears to allow the premium due to be offset using subsequent claim payments. Q22. How does the Emergency Order affect rate filings made after September 4, 2017? A1. The Emergency Order prohibits any insurer, for a period of 90 days, from using a “Use and File” filing to increase rates. A2. The Emergency Order tolls the application of deemers for “File and Use” filings, which prevents the implementation of new rate increases for 90 days. A3. No new rate increases will be approved for implementation prior to December 4, 2017. Q23. How does the Emergency Order affect rate increases that were approved prior to Hurricane Irma? A. Any rates approved with a final disposition prior to September 4, 2017 are not affected by the provisions of the Emergency Order. Q24. How does the Emergency Order affect the submission of “Use and File” filings where there is no rate impact due to the change? A. The Emergency Order suspends all “Use and File” filings which effectuate rate changes. A “Use and File” filing which is a rule filing only and which does not contain a change in rates may be submitted. Q25. How does the Emergency Order affect Informational Filings? A. Informational filings are not subject to the “Use and File” restrictions contained in the Emergency Order. Q26. How does the Emergency Order impact an insurer’s ability to continue with Consent to Rate? A. The Emergency Order does not affect an insurer’s ability to Consent to Rate. Q27. Should insurers amend “File and Use” filings submitted prior to September 4, 2017 with effective dates occurring on or before December 3, 2017 to reflect new effective dates? A. The deemer date for “File and Use” filings pending at the Office as of September 4, 2017, has been tolled. The new deemer date will depend on how long the filing was previously pending prior to the beginning of the tolling period. Insurers do not need to amend their effective dates at this time, but should not plan to implement any rate filings until after December 3, 2017. Q28. How does the Emergency Order affect policy renewals within the next 90 days when increased coverage limits are requested by the insured, required due to updated appraisals, or determined by the terms of an insurance contract will cause an increase in an insured’s rates? A. The Emergency Order does not preclude necessary coverage increases based on requests from the insured, updated appraisals required by law, inflations guard endorsements, or other policy provisions applied upon renewal which may affect rates since such changes are not the result of a rate increase. Q29. Does paragraph (4) of the Emergency Order require insurers to withdraw “Use and File” rate filings and resubmit them as “File and Use” filings if they were filed before September 4, 2017 and not yet approved, if the effective date of the rate was to be between September 4, 2017 and December 3, 2017? Does this apply to all lines of insurance subject to Sections 627.0651, F.S. and 627.062, F.S.? A. Pending filings previously submitted under the “Use and File” provision with an effective date between September 4, 2017 and December 3, 2017 are now considered to be “File and Use” filings. Such filings are not required to be withdrawn and resubmitted, but the time to review such filings by the Office is tolled. This applies to all lines of insurance subject to the “File and Use” and “Use and File” provisions under Sections 627.0651, F.S. and 627.062, F.S. Q30. Does paragraph (5) of the Emergency Order require the rescission of “Use and File” rate changes that were implemented without an accompanying filing, regardless of the effective date of the new rate if it was to be effective before December 3, 2017? A. If a “Use and File” filing was implemented but the appropriate filing was not submitted to the Office, the rates should be immediately withdrawn from use and the previously approved rates should be reinstated. The duration of Hurricane Irma for application of the annual hurricane deductible in Florida includes the time period beginning on September 7, 2017 at 10:00 am EDT and ending on September 14, 2017 at 8:00 am EDT. Ending 72 hours following the termination of the last hurricane watch or hurricane warning issued for any part of Florida by the National Hurricane Center of the National Weather Service. On September 20, 2017k, FEMA released the initial Disaster Federal Register Notice (Initial Notice) from Hurricane Maria. The following amendment was released on September 28, 2017. SUMMARY: This notice amends the notice of a major disaster for the Commonwealth of Puerto Rico (FEMA-4339-DR), dated September 20, 2017, and related determinations. I have determined that the damage in certain areas of the Commonwealth of Puerto Rico resulting from Hurricane Maria beginning on September 17, 2017, and continuing, is of sufficient severity and magnitude that special cost sharing arrangements are warranted regarding Federal funds provided under the Robert T. Stafford Disaster Relief and Emergency Assistance Act, 42 U.S.C. 5121 et seq. (the “Stafford Act”). Therefore, I amend my declaration of September 20, 2017, to authorize a 100 percent Federal cost share for debris removal and emergency protective measures, including direct Federal assistance, for 180 days from the date of the declaration. Brock Long, Administrator, , Federal Emergency Management Agency. As the response to Hurricane Maria continues, and the recovery begins, the Federal Emergency Management Agency (FEMA), and the entire federal family remain focused on life-saving and life-sustaining measures to ensure the safety of residents in Puerto Rico and the U.S. Virgin Islands (USVI). The Department of Health and Human Services (HHS) has more than 300 staff on the ground, including a National Disaster Medical System Disaster Medical Assistance Teams (DMAT), with more on the way. A DMAT is a federalized workforce of doctors, nurses, paramedics, emergency management technicians, safety specialists, and others who provide medical care during natural disaster relief efforts. HHS is working around the clock with staff from the U.S. Army Corps of Engineers (USACE) to re-open hospitals around Puerto Rico and the U.S. Virgin Islands. An Environmental Protection Agency (EPA) Critical Water Assessment Team arrived Thursday to address drinking water needs and conduct wastewater assessments at facilities that service hospitals. As areas become accessible, more fuel is able to be delivered to critical facilities. Puerto Rico hospital fuel needs are prioritized for those serving patients with critical needs.. The Governor Juan F. Luis Hospital in St. Croix and the Schneider Regional Medical Center Emergency Room in St. Thomas were re-energized and re-established as mobile hospitals over the weekend by HHS and Department of Defense (DoD). HHS and DoD are conducting medical evacuations; so far they’ve evacuated more than 150 patients from the U.S. Virgin Islands and Puerto Rico to locations in the continental United States. In the U.S. Virgin Islands, FEMA and the American Red Cross are providing hotel lodging and support for the remaining patients until additional movement can be coordinated. More than half of the dialysis centers in the U.S. Virgin Islands and Puerto Rico are now operational. HHS Liaisons and a Health and Medical Task Force (HMTF) arrived to St. Croix today; additional Liaisons are on the ground in St. John and St. Thomas. These liaisons and teams join the teams and equipment already on the ground serving the residents of the U.S. Virgin Islands and Puerto Rico. Nine FEMA Urban Search and Rescue (US&R) teams working in coordination with the U.S. Coast Guard, U.S. Customs and Border Protection, and others continue to conduct search and rescue operations in Puerto Rico and the U.S. Virgin Islands. Together, these teams have saved or assisted 530 individuals so far. Visit our recovery resources page for a list of resources to help you recover from Hurricane Harvey. To locate a hotel that participates in FEMA's Transitional Sheltering Assistance (TSA) program, visit our interactive map to find one near you. Contact your insurance agent to file a claim. Your insurance agent can walk you through your options. Make sure to photograph the flood damage for documentation purposes. What's the quickest way to apply for federal assistance? Online at DisasterAssistance.gov. Survivors may also apply by phone at 800-621-3362 (voice, 711 or VRS) or 800-462-7585 (TTY). Due to high demand, lines may be busy. Please be patient, and try calling in the morning or evening when call volume may be lower. To get help in person, find a Disaster Recovery Center near you with the DRC locator.